I recently got myself a Juggernaut humbucker by Bare Knuckle Pickups and I couldn’t be happier. The Juggernaut is Periphery guitarist, Misha Mansoor’s signature pickup. Misha worked with Bare Knuckle founder Tim Mills and Periphery bassist, Adam Nolly Getgood to create this juggernaut of a pickup. What sets this pickup apart from the other humbuckers is that it is a combination of a ceramic pickup and an alnico pickup. Ceramic magnets provide greater output and a tighter bass response while alnico magnets provide a deep bottom end and a rich midrange. The Juggernaut has qualities of both. Apart from the unique magnet configuration, it enjoys the best traits of the brilliant Black Hawks and Aftermaths. 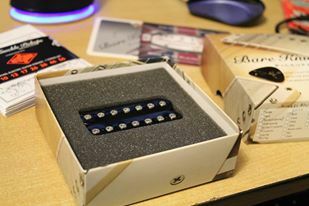 I had ordered a 7 string bridge pickup. It is uncovered, although you have the option to have a laser etched bulb logo covering, among other cover options. The package I received was very ‘satisfying’, for lack of a better word. I got a Bare Knuckle pick, a RotoSound seven string set, a mug coaster, a Bare Knuckle logo sticker and the pickup itself. It always feels good to hold a hand crafted Bare Knuckle pickup in your hands. I had it installed in my RGA7. The very first thing I noticed was that the pickup is very responsive. Even with a little amount of gain, I got massive sounding chugs out of it. You can get an aggressive tone if you pick hard enough and almost clean tones if you pick softly. Since the pickup has a strong midrange, big chords sound fuller and more even than on any pickup that I’ve used before. You can hear every string ring out clearly. Playing seven string chords have never been more fun. High notes sound fluid enough. It is a bright sounding pickup without being too shrill and yet it adapts to the heavy and dark sounding mahogany body of the RGA7 very well. Clean tones aren’t very bright but sound warm and fat, which I prefer. I haven’t done a lot of recording but some of my demos sound brilliant with the Juggernaut. Future mixes sound promising. Overall, it is a very versatile pickup and is great for extended range guitars. Be it progressive metal or rock, metalcore or extreme metal, this pickup can do it all. Though it is better suited for modern metal styles. I can safely say that I will make total destroy. To hear the pickup in action, click here. writing skills as well as with the format in your blog. What’s up friends, its fantastic post on the topic of cultureand completely defined, keep it up all the time.